How often does your child actually need to take a bath? If bath time is synonymous with a struggle in your house, you may feel relieved to find out that your child may not need to be bathed as often as you think. Getting suds-up every day isn’t necessary for most kids. In fact, dermatologists from the American Academy of Dermatology say a little dirt and grime may actually be good for growing bodies. “For children, a few germs here and there are healthy, as this is how their bodies learn to fight off bacteria and build stronger immune systems,” said dermatologist Robert Sidbury, MD, MPH, FAAD. Sidbury says most children only need a bath a few times a week, but bath time frequency is largely contingent on your child’s age and activity level. Age. Children ages 6 to 11 generally only need to bathe two to three times per week, says Dr. Sidbury. Hair type. Before puberty, 6- to- 11-year olds only need to shampoo their hair once or twice each week. However, kids of African descent or kids with dry or curly hair can go seven to 10 days between washes. Activity level. While a few germs may be healthy, a body caked in dirt or mud is neither healthy nor house-friendly. 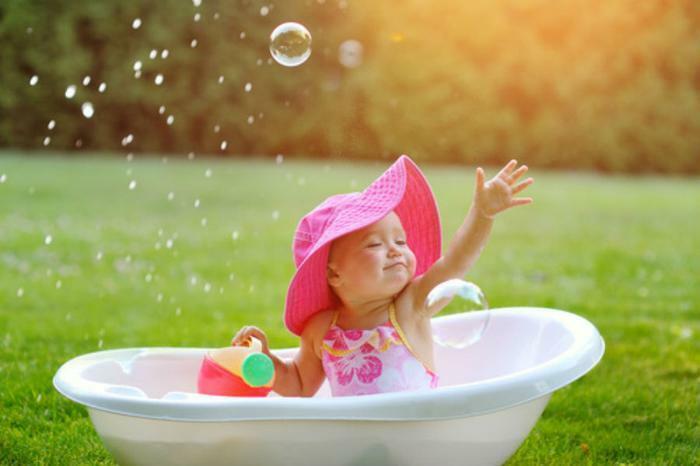 Kids should always bathe after playing in the mud, sweating heavily, or swimming. Puberty. Daily showers and twice-daily face washing should begin when puberty does, around age 12. Hair can be shampooed either daily or every other day, although children of African descent and kids with dry or curly hair can go longer between lathers (hair can be shampooed every seven to 10 days). When bath day does roll around, not every child will be excited. Active young children may not find sitting in a tub to be an activity worthy of eager anticipation. Listen to favorite stories. While kids are soaking, parents can be reading to them from one of their favorite books. Play with a favorite toy. Let your child bring one of their waterproof toys in the tub, or purchase a few toys made especially for bath time. Read a special bath book. Read waterproof bath books designed to be brought into the tub. Think up an adventure. Parents can tap into their imaginations to create an adventure that can make bath time fun. Let kids use bath tub crayons. Bath tubs crayons can keep kids entertained while they're getting clean. You can even make them yourself.